Constipation ek aisa topic hai jis par very few people baat karna chahte hain. Waise har ksisi ki life me ye sabne experience kiya hai. Constipation relief ke liye bahut home remedies hum use karte hain. Lekin fir bhi hum ise apne little secret ke roop me rakhna chahte hain. Some people ye problem some foods ke karan face karte hain, lekin others me ye chronic health issues hota hai. Isme unko regular medication leni hoti hai. Waise constipation commonly 3 tomes a week se less bowel movement ka hona hai. Some peoples ise difficult stool paas hona bhi define karte hain. Some cases me constipation irritable bowel syndrome or diarrhea symptom bhi hai. Constipation yani kabz problem all ages jaise new-born babies to elderlies me ho sakti hai. Medications ki jagah constipation relief ka acupressure effective natural way hai. Ye way without side effect hai jo lasting relief deta hai. 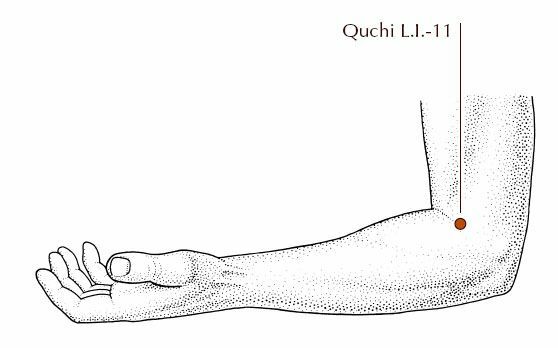 Ye acupressure points ko apni fin ger se stimulate karne se apko abdomen me relax feel hota hai. Saath hi ye regular bowel movements ko without pain aur any discomfart ke promote karta hai. Iske saath hi ye points abdominal pain, bloating aur gas me bhi relief deta hai. CV 6 yani conception vessel 6 constipation relief ke liye important point hai. Ise hum Sea of Qi bhi kahte hain.Iski location belly button ke below exactly 3 finger width hoti hai. Ise aap fingers ki help se stimulate karen. Jo pressure aap is point par den wo 1 inch se deep na ho. Is pressure ko 30 seconds tak maintain karen. Jab ye pressure den tab aap normal breathing karen aur apni eyes close rakhen. Ye point apko abdomen pain, gas, colitis aur constipation relief dega. Iske saath hi ye CV 6 irregular menstruation, hernia, fatigue aur digestive disorders me bhi useful hai. CV 6 शरीर की अन्दुरुनी स्थिति को मजबूत करता है. ये हमारे immune system, urinary system गुर्दे को लाभ देता है. इस पॉइंट से हमारी कब्ज़, गैस, menstrual ऐंठन और अनिद्रा में फायदा मिलता है. 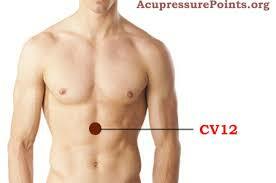 CV 12 or Conception Vessel 12 all types of digestive problems ke solution ka acupressure point hai. Ye quick constipation relief provide karta hai. Ise center of power bhi kahte hain. Iski location body ke midline hoti hai. Belly botton aur breastbone ke base ke halfway between hai. Is point par carefully 2 minutes se jyada stimulate na karen. Aap ise empty stomach apply karen. Agr aap heart disease, hypertension aur cancer se suffer hain to ise avoid karen. Iske use se apko stomach pain, indigestion, heartburn aur emotional stress aur abdominal spasm se nijat milti hai. Inke saath hi ye point insomnia, vomiting aur jaundice me bhi help karta hai. 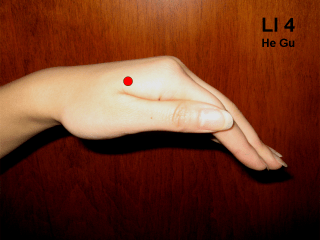 Li 4 means Large Intestine 4 various health issues ke liye most famous acupressure point hai. Iske saath hi constipation relief ka important point hai.Ise hum velly point bhi kahte hain. Iski location thumb aur index finger ke fleshy muscle ke between hoti hai. Apne thumb ko index finger se dur spread karen aur fleshy part ko apni fingertips ki help se 1 minute stimulate karen. Is waqt aap long deep breaths lete rahen. Iske baad 1 minute other hand me bhi isi point ko stimulate karen. Ye apko chronic pains, eye problems, toothache, allergies, boost immune system aur constipation me relief dega. Ek baat dhyan rakhen ki is point ko pregnant women me use na karen. Kyonki jab is point ko stimulate kiya jata hai tab uterus me premature contractions ke chances badh jate hain. ये पॉइंट अंगूठे और इंडेक्स फिंगर के बीच वाली जगह होता है. यहाँ दबाने पर सरदर्द, दांत का दर्द, गर्दन का दर्द, कंधे का दर्द और कब्ज़ में फायदा होता है. 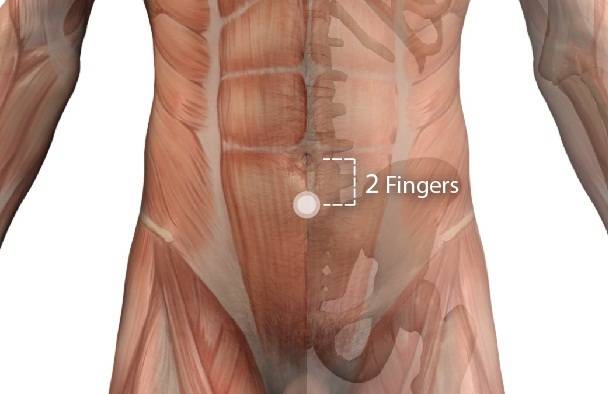 St 36 yani Stomach 36 ka acupressure point intestinal disorders, stomach aur constipation relief me helpful hai. Ye whole body strength increase karta hai aur digestion ko promote karta hai. Ye Three Mile Point ke name se bhi jana jata hai. Ye kneecap se four finger width situated hai. shinbone ke outside one finger width towards hai. Is point ko apne palm se both legs me 1 minute briskly rub karen. Ye point asthma, insomnia, nervousness aur depression me bhi useful hai. ये एक्यूप्रेशर पॉइंट पैरों के घुटनों के नीचे लगभग 4 अंगुल की दुरी पर होता है. इसे दबाने पर अपच, डायरिया, जी मचलना, पेट फूलना और कब्ज़ की समस्या दूर होती है. 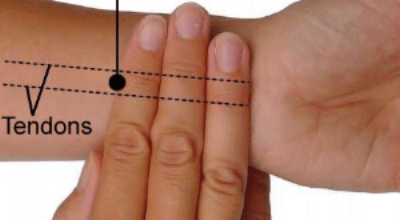 PC 6 yani Pericardium 6 bhi ek effective acupressure point hai. Ye point figures me dikhaye gayi location par situated hai. Ise hum aise samjhen ki ye point wrist ke four finger width tendons ke hollow between locate hai. Is point ko Inner Gate bhi kaha jata hai. ये एक्यूप्रेशर पॉइंट हथेली के नीचे कलाई पर होता है. यहाँ दबाने पर पेट की गडबडी, साइन में दर्द और हाथों में दर्द में रहत मिलती है. Li 11 yani large intestine point hamari intestinal tone ko balance karte hain. Ye point constipation aur diarrhea me helpful hai. Ye point elbow ke outer-end par locate hai. Deep breath lete hue 1 minute is point ko press karen. Best results ke liye is process ko repeat karen. Is point ko press karne ke benefits hain- constipation, indigestion, high fever, elbow pain, diarrhea aur heat stroke, skin diseases. Li 11 यानि बड़ी आंत का पॉइंट हमारी कोहनी के बाहर की तरफ कोहनी मोड़ने के जॉइंट पर है. गहरी सांस लेते हुए इस पॉइंट को 1 मिनट के लिए दबाएँ. इससे आपको कब्ज़, गर्मी, त्वचा रोग, कोहनी दर्द और दस्त-बुखार में आराम मिलता है.